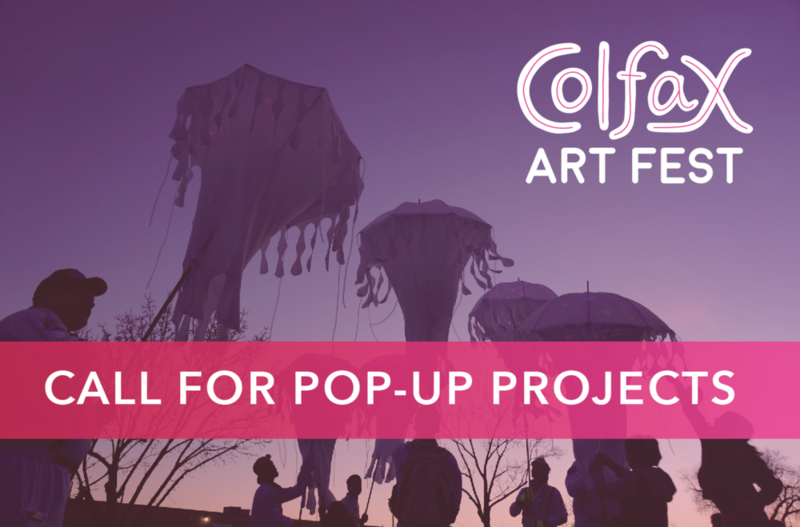 Colfax ArtFest Call for Pop-Up Projects! Colfax ArtFest seeks interesting, interactive, walk-through, exploratory pop-up installations to showcase at our one-day festival. We welcome pop-up projects in any medium including but not limited to auditory and sound installations, lighting projects, digital art, walk-through physical spaces, video installations and other. Installations will be built and installed prior to the festival to be showcased the evening prior to the festival at a V.I.P. reception and then during the festival itself. Your stipend is determined by your proposal including project scope, materials, installation timeline, etc. Please note that you will be awarded a single amount to cover all expenses including installation, drop-off, materials, labor and teardown. Our primary goals for your installation are to engage and delight our audience. We are particularly interested in projects that are exploratory, interactive or immersive. While we don’t have an overarching theme or specific requirements for your installation (we welcome any and all submissions), we do ask that you take our history and our strong connection to Colfax Avenue into your frame of reference as you develop your concept. Please see specific submission requirements below. The West Colfax corridor in Lakewood, CO has a long history of transformation. It started out in the late 1800’s as an agrarian sanctuary, away from the hustle and bustle of Denver, replete with apple orchards, sprawling farms and quaint houses. In the 1920’s and through most of the 1950’s West Colfax served as the ‘Gateway to the Rockies’ for countless locals and tourists. Businesses, restaurants, motor inns and dance clubs flourished and the avenue embraced America’s car culture and our love of the open road. New developments and larger highways rerouted traffic however and West Colfax fell into a long period of decay and decline. Today, perspectives are shifting again. West Colfax is home to one of 23 Colorado-certified creative arts districts, 40 West Arts, and now houses a modern light rail system with direct service to downtown Denver, more walkable and bikeable neighborhoods, new restaurants and shops, and an active community committed to growth and renewal. By the submission deadline, please email to submissions@40westarts.org the following information. The subject heading on your email should read ‘Pop Up Project’. Please combine ALL documents & images/renderings into one PDF document and submit only one attachment with your email.